She was born to Eli Horvath Wellin, a blacksmith, and Anna Schneirson Wellin, in Worcester on April 26, 1923. The third of seven children (an eighth died in infancy), Jeannette grew up in poverty, sometimes subsisting on soup her mother made from boiling turnips and beef bones and sleeping in one bed with all of her five sisters. Eli and Anna had escaped to America from the pogroms in the Ukraine during their teens, settling in a community of Communists and raising their children within the party. The girls were told to attend secretarial school, but Jeannette wanted to be an artist. She also grew into a prodigious reader of great literature and was never far from a thick book throughout the rest of her life. Henry James, Anthony Trollop, Jane Austen and Saul Bellow were among her very favorites and she read and re-read their works until weeks before she died. In 1940, at the age of 18, she married Markus Margosian, the brother of a close friend. He immediately shipped out to fight in World War II and was killed six months later in Papua, New Guinea. Jeannette, heartbroken but undaunted, moved to Greenwich Village in New York city to attend art school. To support herself, she enrolled in a stenography course, and eventually became a court reporter, continuing in art school in the evenings. 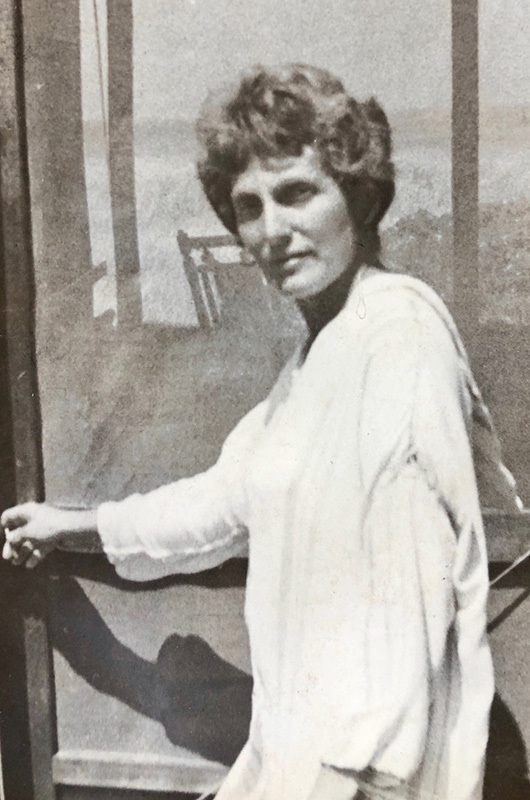 In 1945, she met William Herrick, back from fighting in the Spanish Civil War, working as a court reporter himself and focused on founding the Federation of Shorthand Reporters. The couple eventually moved to Westchester County with their three small children and settled for a time in Mamaroneck. Years later, when Bill sold a book to Hollywood, the couple decamped from suburban New York to upstate New York, and Jeannette eventually decided to return to school for her doctorate. She gained an Ed.D. from the University of Massachusetts and spent 10 years working as a family therapist in North Adams, primarily focusing on women struggling to make their way as mothers in poverty-stricken towns. When she retired from her work as a therapist, she created a series of multimedia art pieces of these women and their children. The pieces capture both Jeannette’s fondness for the people she had worked so closely with, and their sadness. Jeannette continued to work as an artist into her 90s when she focused mostly on creating fabric and woven hangings. Her last art exhibit was in 2011 at the National Women’s Democratic Club in Washington, D.C., where she ultimately moved to live near her daughter. Jeannette and Bill married in 1948, and during a honeymoon in Truro, came over to Oak Bluffs for the day. She was enchanted by the cottages in the Camp Ground. In 1955, the couple visited friends on Music street in West Tisbury, and when they trekked up to Aquinnah for the day, Jeannette found her favorite part of the Island. 1 Bill and Jeannette bought a home on Lighthouse Road in Aquinnah. A year later they bought land near Dogfish Bar, and in 1963, had Herbert R. Hancock build them a house off Oxcart Road close to the beach. Though both Jeannette and Bill worked as court reporters while raising their three children, Jonathan, Michael and Lisa, they were Bohemian artists at the core. Jeannette became a painter and sculptor and Bill became a novelist, eventually publishing 11 novels and one memoir. They each took 10 weeks off every summer and spent that time in Gay Head. The family put down roots on the Island and developed close friendships that lasted for decades with Islanders and summer people alike. Bill and Jeannette spent hours on the beach near Zacks Cliffs with a crowd of friends including Gloria and Mike Levitas and Joan and Stanley Halperin. They invited off-Island artist friends including writer Thomas Berger and his wife, Jean, painter Robert Andrew Parker, and painter-sculptor Eli Friedensohn. Later in life, Jeannette and Bill grew to be close friends with mystery writer Richard Lipez and his husband Joe Wheaton, a sculptor of large scale steel pieces. The Herrick children grew their own close relationships over the years, bringing the next generation of grandchildren into the magic of Martha’s Vineyard. Though the Herricks sold the house on Dogfish Bar in 2004, they remain rooted in Aquinnah via the home owned by Lisa and her husband, Drey Samuelson off of Lighthouse Road. She is survived by her three children: Jonathan Herrick and wife Barbara Carroll, Michael Herrick and his wife, Shelley Herrick, and Lisa Herrick and her husband, Drey Samuelson. She is also survived by her former daughter in law Pearlyn Goodman-Herrick, her grandchildren Sarah Herrick Morris and Nicholas Herrick Morris, Anna and Lea Goodman-Herrick and by a wonderful extended family that includes niece, Joanne Jones, grand-niece, Rachel Jones, and nephew Eli Silver. Pat Hughes, Oak Bluffs, Ma. Michael and Lisa, I am sorry to read that your Mom died. I was sorry I never got to meet her. She certainly had an interesting and long life. The end of a great chapter in your lives, but to live on in your children. My condolences to all in your family.